This is a one script proof of concept where you can manipulate a character by dragging it across the screen and avoid the obstacles that are coming towards you. // Set up a basic scene - just a camera with an orthographic view and a z distance of -10. Drag a background on to the scene if you like. Add 2 GameObjects with sprites to the scene. 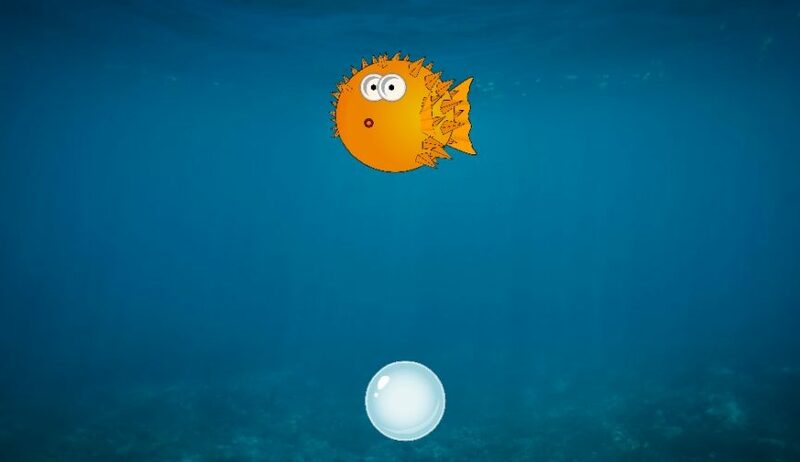 I have a bubble and a puffer fish so I named them "bubble" and "puffer". Add a RigidBody2D to both and set them to Kinematic. Add a 2D collider to both (I went with a circle colider) and make sure at least one of them has the trigger box checked. // You need to update the mouse position constantly and get its co-ordinates in world space instead of janky mouse space. // You can Raycast to see if you are clicking on the bubble. The Input.GetMouseButtonDown (0) is checking if the left mouse button has been clicked. // This makes the bubble follow the mouse. // This stops the bubble from following the mouse if the button is released. // If you collide with the fish it also just makes a new one. Here is where you would loose if you were trying to avoid the fish..
// this quick code moves the pufferfish back to the top and randomises the x position so it appears in different places.